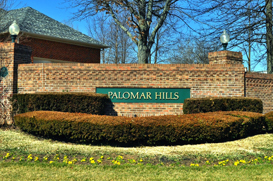 Located outside of West Lexington, Palomar offers home buyers a variety of choices in styles and sizes in real estate, ranging from spacious 5-bedroom houses to elegant townhouses. But what makes Palomar a great choice is the friendly neighborhood atmosphere. Most homes include decks and beautifully landscaped yards to have outdoor barbecues and family picnics. On top of that, your residence will be within the Fayette County School District, offering you the best choices in schools for your family.Palomar is also located near the Bluegrass Airport, Palomar Center, Beaumont Center, and Keeneland Race Track. Lexington is a short drive away, giving you the opportunity to enjoy all the entertainment and dining the big city has to offer. Music enthusiasts can take pleasure in the Lexington Philharmonic Orchestra and art enthusiasts can view the wide range of art galleries within the metro area. There are 2 types of property to choose from Palomar real estate: Single-family houses and townhouses. Many homes command 5,000 square feet of living space, outfitted with 5 bedrooms and 4 baths. Home features may include hardwood floors, tray ceilings, decks, and fenced yards. Available townhouses have open floor plans and provide buyers with private patios and optional green space. Other amenities to enjoy are the Palomar Clubhouse, which houses 3 pools, a basketball court, and a tennis court. Average Price per Sq.Ft. : $100 sq.ft.